Uptown Theatre opening day advertisment from the Chicago Herald Examiner, August 18th, 1925. Image courtesy CRCC collection. Today at High Noon, at 12 o'clock sharp, the Uptown Theatre OPENS ITS DOORS. Drop everything and come! The Uptown Theatre's opening is too magnificent a moment to miss. Come for the most awe-inspiring sight of your life. There's An Acre of Seats. 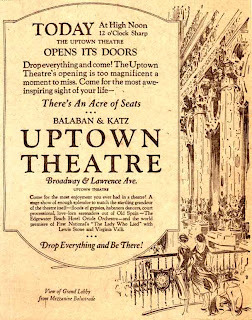 Balaban & Katz Uptown Theatre Broadway and Lawrence Avenue. Come for the most enjoyment you ever had in a theatre. 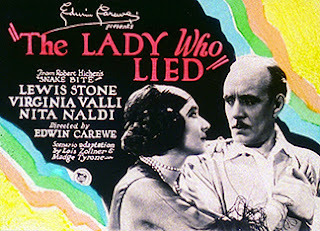 A stage show of enough splenor to match the startling grandeur of the theatre itself—floods of gypsies, habanera dancers, court processional, love-lorn serenaders out of Old Spain—the Edgewater Beach Hotel Oriole Orchestra—and the world premiere of First National's "The Lady Who Lied" with Lewis Stone and Virginia Valli. Drop Everything and Be There!